This week 14 year old Karthik Nemmani from Scroggins Middle School in Mckinney Texas won the 2018 Scripps Spelling Bee Championship. 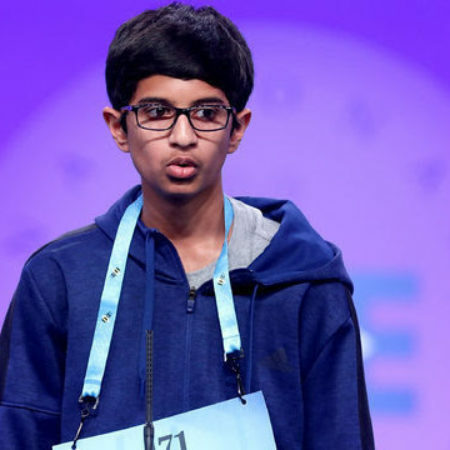 First he had to spell the word “haecceitas” after runner up Nayso Modi from Frisco, Texas was eliminated when she failed to spell the word “Bewusstseinslage” correctly. I can’t pronounce these words never mind spell them. Then, Nemmani had to spell the word “koinonia” for the win. I don’t particularly like watching the Spelling Bee Championship. Besides bad memories from childhood (both mine and our son James’) I am way too uncomfortable watching these kids deal with the intense pressure. They look like they are going to have a nervous breakdown as they twitch, sweat, pace and shake while trying to figure out how to spell the word. They develop tics and involuntary spasms as they try to piece together the definition, tense, language of origin and part of speech of the word. I am convinced this falls somewhere on the child abuse spectrum. I am sure these kids need years of therapy after one of these events. Acts 2:42: They devoted themselves to the apostles’ teaching and to fellowship, to the breaking of bread and to prayer. 1 Corinthians 1:9: God is faithful who has called you into fellowship with his Son, Jesus Christ our Lord. 1 Corinthians 10:16: Is it not the communion of the blood of Christ? The bread that we break; is it not the communion with the body of Christ? 2 Corinthians 6:14: What fellowship has light with darkness? Philippians 3:10: That I may know Him and the power of His resurrection and the fellowship of His suffering. 1 John 1:3: And that you may have fellowship with us; And truly our fellowship is with the Father and with His Son Jesus Christ. a. Holding something (i.e. our faith) in common. b. Living in inter-dependent relationships. c. Being led and empowered by the Holy Spirit. d. Unity with Christ and one another. Living in peace with God and each other. g. Actively doing God’s will. Fellowship is not only being together but doing together with hearts unencumbered by the cares of this world. It is living with a Christlike attitude of love and compassion while extending the grace of God to one another and to the world around us . And it is not simply “doing things together” but actually serving the Lord and extending His kingdom. “Koinonia” is the opposite of The Spelling Bee. People are not supposed to feel pressure, be nervous, twitch or develop tics and spasms. They are not supposed to feel insecure or live under the pressure of trying to succeed or please people or God. Instead, fellowship is meant to be sweet and comforting, a time of joy and passion that is centered around the love of Jesus. It is non-threatening and non-condemning. As we share Jesus with one another we share His spirit, invite His presence and experience intimate spiritual communion. We may have a great meal together, share some laughter and talk about our families. We may even bring up a Bible verse or discuss the sermon. But that does not necessarily mean we have shared “koinonia” the fellowship of the Father, Son and Holy Spirit. It is possible to go to church and talk to a lot of people but not necessarily have experienced fellowship. At church we do “Food” great We do “Fun”pretty well too. But we are not always so good at doing “Fellowship”, not in the sense of Biblical “Koinonia.” It’s time to make church feel a lot less like a spelling bee and more like a community of spiritual interconnectedness. What do you think? How does this make you feel?